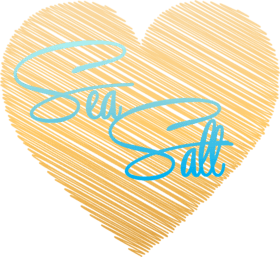 What are Finishing Sea Salts? Finishing salts are the very best of gourmet sea salts. Finishing salts can make ordinary food extraordinary. These salts can make just about any dish amazing with just a few sprinkles. Use gourmet finishing sea salts and a meal is totally transformed from bland to balanced. The finest finishing salts come from very specific locations that are renowned for the quality of their sea - either inland or directly. There are many different types of gourmet finishing salts. And it can be difficult to know which ones to try or which ones will work best with different foods. Many people want to know what sea salts do the top world chefs use so that they can try them at home. However, there are so many more sea salts that are exciting colors, textures & shapes and maynot be quite as well known as these. Discover all about the world of finishing salts below ! How Are Finishing Salts Used? Many people don't realize what a difference using sea salt instead of table salt makes to dish. Sea salt has a completely different flavour and texture from manufactured table salt. Natural organic sea salt is produced without additives & minimal processing - the crystals are unique and taste incredible. Many top chefs think of finishing sea salts in a similar way as wine - it is an expression of the "terroir" - of the minerals of the earth from where the salt originates. Finishing off your recipe with a gourmet sea salt is a great way to complete and enhance meals. There are so many different sea salts to choose from - which is so much fun - and they originate from exciting corners across the globe. How is Sea Salt Different From Ordinary Table Salt? Even though all salt comes from seawater. It is common to distinguish between inland salts and salt directly from the oceans. Both originating from the sea from mineral deposits formed anywhere between millions and hundreds of millions of years ago. Very often, these salts are harvested manually by skilled craftsmen. Artisan salts are straight from the ground or sea , hasn’t been stripped, does not contain additives, and is loaded with minerals and flavor. Typically, gourmet sea salts do not go through a lot of processing. Because of the lack of manufacturing, artisan sea salt will still contain a variety of different minerals that naturally occur. And due to a varying amount of mineral content, different sea salts will have different colors and flavors. Gourmet Sea Salts will also range in texture and shape. Salt occurs naturally in the oceans in a dissolved for. It is common to distinguish between inland salts and sea salts, both originating from the sea, with the mineral deposits being formed anywhere between millions and hundreds of millions of years agao. Inland salt can either be directky mined - such is the case with Himalayan Pink Salt from Pakistan and Persian Blue Salt from Iran. Inland sea salt can also be harvested by sending water down into the deposits to dissolve the salt and then evaporating the resulting the brine until only the pur sea salt crystals or flakes are left. Murray River Pink Salt Flakes from Australia are created this way. There are many different types of sea salt, including Pink, Celtic, Flakes, Maldon, Australian and so many more. Table salt, however, usually comes from mines of salt deposits. These deposits are typically located underground. Iodine and anti-clumping additives are added to table salt, and it undergoes a lot of processing. This greatly changes the flavor of the salt. A lot of the useful minerals are stripped from table salt during processing. As a general rule, quality sea salts have a high moisture content. And as the finest salts there are, finishing salts are no exception. Most have a high level of moisture, despite their texture. So clumps of sea salts may still be slightly wet, which is a good thing because some moisture helps retain the salt’s flavor and structure. A salt with low moisture will take water from the food it is used with. This causes food to dry out. Sea Salts can be either a snow-white heap of teeny cubes, or they can be pyramids or delicate pink flakes that crunch between your teeth to make a flavorsome finishing salt. Finishing salts not only vary in texture and flavor but also in shape - they can be either flakes or crystals. Flake salt is produced from evaporated sea water, just like other sea salts. However, the evaporated brine is heated very slowly, often by the sun, so that very fragile crystals are created. These crystals usually look like pyramids. There are different sizes of flake salts, but all have a light, delicate flavor. Flake salt is especially good to use on salads, as larger crystals can overpower a salad's light flavor. Different Types of Finishing Salts? Trying different finishing sea salts is a great way to learn about the differences in their flavours and which foods they compliment well. No matter what salts you love most, always keep several types on hand and try to use each for its ideal purpose. Fleur de Sel is one of the finest finishing salts available. It comes from France and is carefully collected using ancient Celtic techniques. Fleur de Sel is created from only the top, or newest, crystals formed by evaporation. It typically has a very high moisture content and is very crunchy. The harvesters only use wooden tools and can only make the salt once a year. Grilled meat, vegetables and salads can all benefit from Fleur de Sel. Hawaiian finishing salts are usually more dense than table salt. This makes them retain their crunchiness for longer. There are several types of Hawaiian salts. Black Hawaiian salts get their color from the activated charcoal they contain. The charcoal gives it a unique flavor and interesting black color. It is excellent to add to a finished dish to provide a new flavor and contrast in color. Another Hawaiian finishing salt is Alaea. It has a red or orange color from alaea clay, which is the salt's namesake. This has a less intense flavor than other sea salts. Alaea salt works well on pork, prime rib and traditional Hawaiian food. Australian finishing salt comes from the Murray River. This is a fantastic finishing salt, as its flakes easily melt and do so very uniformly. These salts get a light orange color from algae contained in the river. This salt can be used for baking or roasting poultry and other meats, as well as for finishing any dish. ​Maldon finishing salt comes from England and is made using traditional methods. It is a very flavorful finishing salt and has delicate flakes that can be crumbled by hand. This salt is wonderful on fish, leafy green vegetables, salads and even some fruits. Cooking gourmet food at home is becoming a popular activity. Many people are hearing about the benefits of sea salt and how they can improve the flavour of food. Many top chefs are now suggesting the use of finishing salts to enhance finished meals. Finishing Sea Salt comes in all sorts of varieties with varying flavours and textures. Choosing the right finishing sea salt can make all the difference, making the your favourite dish literally "zing" with flavour.